Other recycling services may dispose of your cartridges in landfill or incineration. Have you ever asked what they do with the ones they can’t reuse? Many services play on the word “recycling” without fully providing the service advertised. This is where we are different. 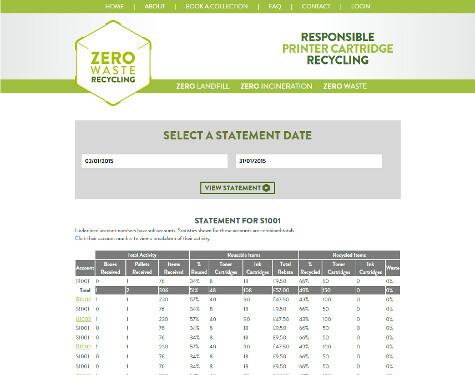 Here at Zero Waste Recycling, you get exactly what you pay for - a comprehensive recycling service that adheres to the principles of the Waste Hierarchy. We understand your corporate responsibility and duty of care to the environment, and we will only recycle or reuse your waste cartridges - nothing gets disposed of into incineration or landfill. Book a collection with us and let us handle your waste responsibly. The Zero Waste Recycling program will accept all of your empty cartridges, full cartridges, original cartridges, remanufactured cartridges, waste cartridges, spent toner, used OEM cartridges, laser cartridges, transfer belts, old ink tanks, empty inkjets, compatible laser cartridges, surplus inkjets, unwanted inkjets, un pulled toner, out of date cartridges, used fuser units, broken laser carts, damaged cartridges, printer drum units, empty toner bottles, and waste printer bottles, basically any printer cartridge consumable you want to dispose of. We accept all waste printer consumables from the following brands: Brother, Canon, Dell, Epson, HP - Hewlett Packard, Kodak, Konica Minolta, Kyocera, Lexmark, Neopost, Oki, Olivetti, Panasonic, Philips, Pitney Bowes, Ricoh, Samsung, Sharp and Xerox. These can be remanufactured, compatible or original cartridges from the OEM or alternative suppliers like 5 star, Armour, Badger, Cartridge Monkey, Cartridge World, Colour Direct, Data Products, Enviro Solutions, Euroffice, Footprint, Green Planit, Green Tech, Infotec, Infotone, Ink & Toner, Integral, Jet Tec, KMY, Longbow, More inks, MSE, NRG, Office Depot, Office Express, Office Express, Office Green, Office Supplies, PC World Essentials, Peach, Perfect Green, Print Rite, Printerinks, Refresh Cartridge, Staples, Stinky Ink, Supplies Team, Sure Basic, Tinto, Toner Giant, Toner Man, Viking Direct, Xenia, XPS and any other printer cartridge brands you may have. All organisations in the UK have a duty of care to manage their waste properly through UK, and EU, legislation and your internal environmental policies. 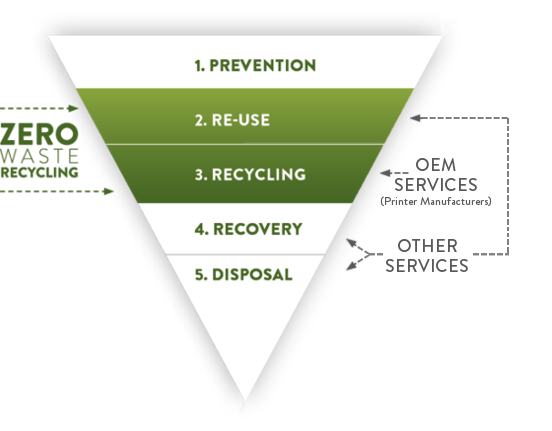 The Waste Hierarchy chart should be applied to your decision making (article 4 of the current EU Waste Framework Directive) in order to fulfil your duty of care (Environmental Protection Act 1990) when managing your waste. We fulfil your obligations simply and easily, no matter what size or shape your organisation is by providing Waste Transfer Notes and a Zero Waste Certificate which is your proof that none of your printer cartridge waste went into incineration or landfill. Printer cartridges that cannot be reused are safely broken down into their different material components and then manufactured into alternative products such as car parts, steel building structures, aluminium cans, marine paint, road surfacing, and colorant products. Welcome to our Zero Waste Recycling programme. The UK's most innovative printer cartridge recycling service.